In a world filled with distractions, saturated with daily news of hatred, violence and disasters… including the recent shocking and sad disaster of the Notre Dame Cathedral… which reminds us of the importance of having a place of community and worship… amid an ever-growing materialistic and self-centered society that spurns the moral and seems to have no time for God… it may, indeed, seem very hard to focus on the Risen Christ today, Easter Sunday. Its glorious 50-Day Season challenges us to take a long look at our lives in light of Jesus’ life, death and resurrection. And when we honestly do, we then are called to give thanks to God… our sincere thanks that needs to be reflected in the choices we make each day… choices that clearly, automatically and naturally… like the air we breathe… make clear that our faith in God makes a difference in our life… choices that, amid the world’s darkness and disaster, reflect the love, compassion, respect, caring and forgiveness of Our Lord. And so, once again, we gather on this Easter Day of Resurrection… in the humble knowledge that we continue to try our best to be humble servant-disciples to one another… as well as to all we meet… sharing our hope, trust and belief in the Gift of Eternal Life that God promises and graciously bestows… a reality especially meditated upon in this year’s Passion Play. And as I ponder and meditate upon God’s glorious gift, I continue to ponder and give thanks to God for each and everyone of you for the continued joyful Blessing and Inspiration that you continue to be to my Priesthood, the faith journey that we live and share… as well as my passion for writing! Ditto, deepest prayerful gratitude for your beautiful encouraging and inspiring messages, cards, prayers, gifts and scrumditily-umptious goodies… for our walking together and upholding each other so that all we hope to accomplish, as a Parish Family, glorifies God… ditto prayerful gratitude from Deacon Frank, Fr. Bob Sickler and Dobby the Church Cat who shares a “Double-Paws-Up” of appreciation. My prayerful Easter Wish is that God the Father recreates in us the love with which He bestowed upon the world in His Son’s Passion, Death and Resurrection… that we never lose hope that God’s love can transform the darknest nights of our lives into the glorious morn of Easter joy. May the compassion we behold in Jesus illuminate all of our darkest nights… and may the empty tomb be our hope that we can rise from the sadness and despair that entomb our world… as well as ourselves. May we recognize the Risen Jesus walking among us in the love and forgiveness that we live and share. Don’t let “wascally wabbits” make a basket-case of our celebrations… and may we savor every-calorie-free morsel of our Easter Tables & Treats! Happy Easter! From the comfort of our living rooms, many of us have watched in vicarious fear while some fictional character plunges through a darkened, unknown door. Don’t go in there, we call out, you don’t know what’s waiting for you! Yet we know they must go through the door or the story would end. How much less entertaining it is, when those gaping, dark openings occur in our own lives, and we are faced with the same choice: Go forward, and face the unknown? Run away to someplace safe and ignore the possibilities? On Easter morning Mary of Magdala entered the graveyard, prepared for a sorrowful sight. Instead, to Mary’s horror, she found a gaping dark hole where the tomb’s stone should be. Filled with fear, she ran, but only far enough to find help. Then she comes back strengthened ready to learn what wonders God had worked. May the message of Easter morning strengthen us as we encounter the fearsome openings in our lives. And though at first we may run, may we return just as Mary did, to witness God’s marvelous resurrection power. 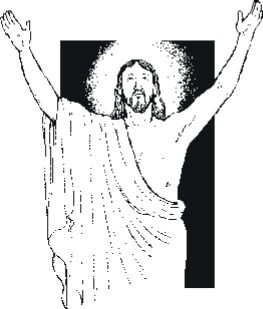 The true basis of our Christian faith is the resurrection of Christ. If Jesus didn’t rise from the dead, “we are of all men to be pitied” just as St. Paul said. (1 Cor. 15:19). To strengthen our sometimes wavering faith, God has provided strong reasons to believe in the reality of the resurrection. Many people saw Jesus and had fellowship with Him after the resurrection. They boldly, courageously proclaimed the fact of it. They were willing to die for the truth of it. They saw lives changed by the reality of it. The Church was born on the basis of it and continues to exist because of it. And our own hope of victory over the tragedies in life and death at the end is ours only because of the resurrection. We have been given so many reasons to believe, why then are so many of us still in doubt?